Grubzon - A Gourmet Voyage: Chai Pe Charcha - Prabhadevi, Mumbai. 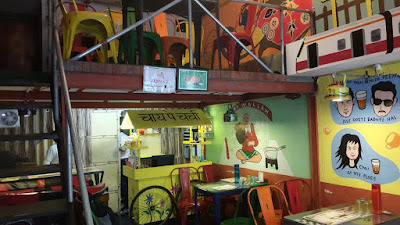 Chai Pe Charcha - Prabhadevi, Mumbai. After a day long trek in the ascending passages, we finally made it to the surface. We were tired as we had been up all night walking. I was worried that firsty may get the wrong message and leave without us but he was waiting for us. Turned out that Firsty had found from the townsfolk that there was a passage that connected the strange undersea city with the island above. As the sea was normal again, we set out to sail. On to the next mark. One can only wonder what more surprises will the sea of shipwrecks throw at us? Chai Pe Charcha is a simple concept but quite a popular one. After the roaring success of the brand's Lower Parel outlet, CPC comes to my neighborhood in Prabhadevi. Its located in a connecting lane between two main roads and is thus not very easy to find for a person not living in this area. It is bang opposite the Prabhadevi Mandir. If you are into the Pokemon craze, then it is right opposite a Pokestop. However, don’t let its unpopular location fool you. 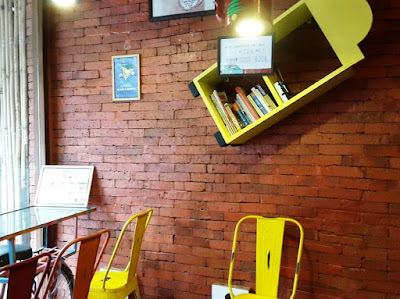 This little café is as popular as its Lower Parel sibling. Who knows, it may even be more popular. The Café felt like a mix of a small highway restaurant and a modern bistro. There were artifacts that signify Mumbai like the popular Auto Rickshaw shaped table or the Mumbai Metro cut out on the ceiling. The baked bricked appearance on the other side with a book shelf added to the mix of themes. There is simplicity, there is sophistication and there is ultimately comfort. The tables resemble those found in neighborhood tea stalls. If that wasn’t enough, there was even a yellow colored street food "Thela" or cart. The place makes an ideal hangout for friends. 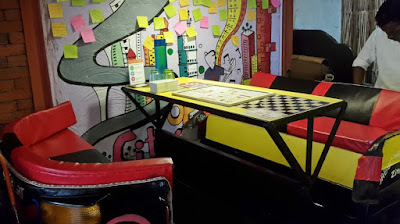 The cafe is more than just talk, it also provides fun board games like Ludo or chess which people can play while talking. The café is crowded at most times of the day. Since the place is tea themed, I started out with one of their special beverages. 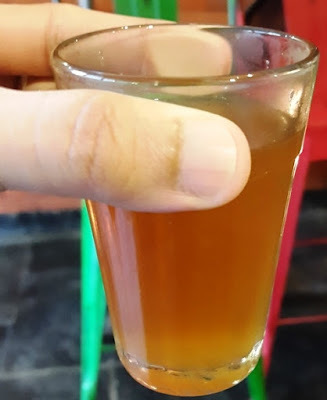 The Hajmola Chai was a milk free and sugarless tea that was tangy and lemony. It was made out of lemon, Rock salt and other ingredients which are often used to make the digestive candy Hajmola. Not only was this tea comforting on the tongue, it was also good for digestion. Of all the health based teas that I know, this was by far the most tasteful. Of course this isn’t the only tea on their menu, there are many other unique beverages waiting to be tried. Captain : I'd like my tea on the deck. Crewmate : You should get some sleep Cappy. Firsty can take care of things. Captain : Firsty was up all night too looking for us. He can take care of things later. I will manage the helm now. 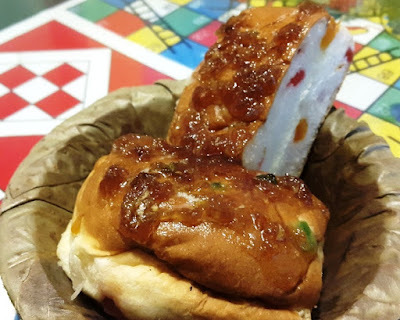 Gulkand Bun Maska for 45 INR was a steal of a treat. It made regular bun maska look like a thing of the past. This soft bun was generously coated with Gulkand (a sweet preserve made of Rose petals) and had butter in the centre. It combined sweet, pleasant and savory. It also went really well with my Hajmola tea. I would greatly recommend this to the reader. Firangi Khakra was a delectable fusion of Masala Khakra(Savory Mat bean Crackers) and Nacho's Cheese sauce. My only question was, why was this not done before anywhere else? It was such a brilliant fusion. The Khakra pieces went really went with the sauce and it was a salty, savory and cheesy sensation. I ended up licking my fingers clean after this. 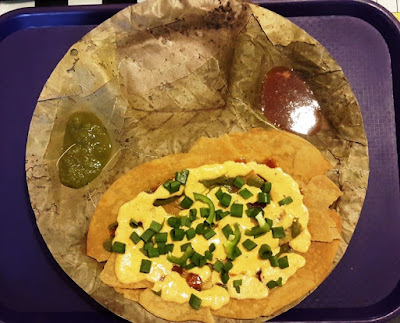 This was served on a plate made out of a leaf and there was sweet and spicy chutney as well. I would however recommend the Khrakra to be eaten with the cheese and only use the chutneys if the sauce is exhausted. Again for just INR 72, this was an amazing treat. 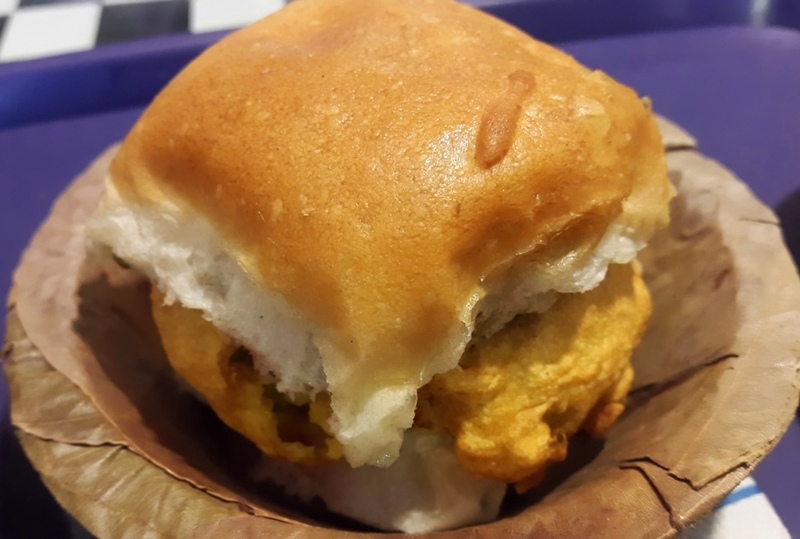 The Good ol' Vada Pav tasted very much like a High School canteen Vada Pav. It was the kind that I have grown up with. No nonsense, no theatrics, no secret ingredient - Just plain good vada pav as its meant to be. Lookout : (Rings the warning bell) Mist ahoy. Captain : Barnacles. There could rocks hidden in the mists. This is the sea of ship wrecks after all. Firsty :(Yawn) Sleep will have to wait mate. We need all hands on deck. The cafe employs differently abled staff members who have been trained well despite their limitations. The service is decent at this cafe. As mentioned earlier, one of the best things about CPC is their pocket friendly pricing. One could easily have a satisfying meal for under INR 150. It doesn't get any better than this. Chai Pe Charcha is an idea that is already rolling on the highway like a juggernaut. It is likely that within a few years time, these cafes will pop up in all densely populated neighborhoods. But for now, I feel privileged to have one of these near my home. Navigator : The winds are too strong, we cannot turn and we cannot drop anchor. We will have to go through this mist. Captain : Aye, fold in the sails and lower the speed as much as possible. If the winds are strong, the mists should not stay here too long. We need to stall some time. First mate : The visibility is going down by the second. This mist is dense. Captain : All hands alert. We don't know whats out there. Ready on the arms. Gunner : Aye Aye Captain.